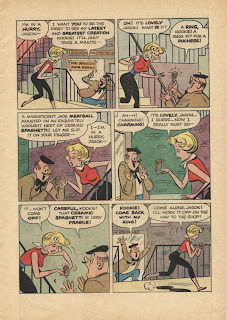 1961 marked a turning point in John Stanley's comic book career. 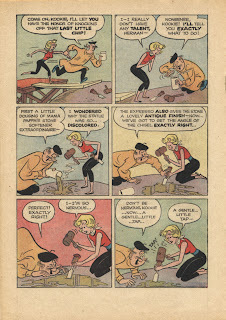 He wrote the last issues of his final significant licensed-character series, Nancy and Sluggo. From then on, with three exceptions, Stanley never again worked with anyone else's characters. It was a shot in the arm for Stanley. His two years on the Nancy title, added to 15 years on Little Lulu, left him apparently (and understandably) weary of the task of adapting outside characters to the comic book narrative form. 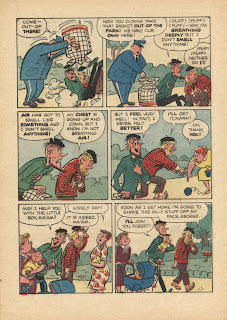 Save for mid-1960s comics adaptations of Alvin and the Chipmunks and Clyde Crashcup, and 1969's curious Choo-Choo Charlie one-shot, Stanley only created original concepts, characters and series from 1962 forward. His earnest attempts to get original series going in the late '40s failed. Although "Jigger and Mooch" and "Peterkin Pottle" have their rightful admirers, they simply didn't cut it, sales-wise and audience-wise, back in the day. 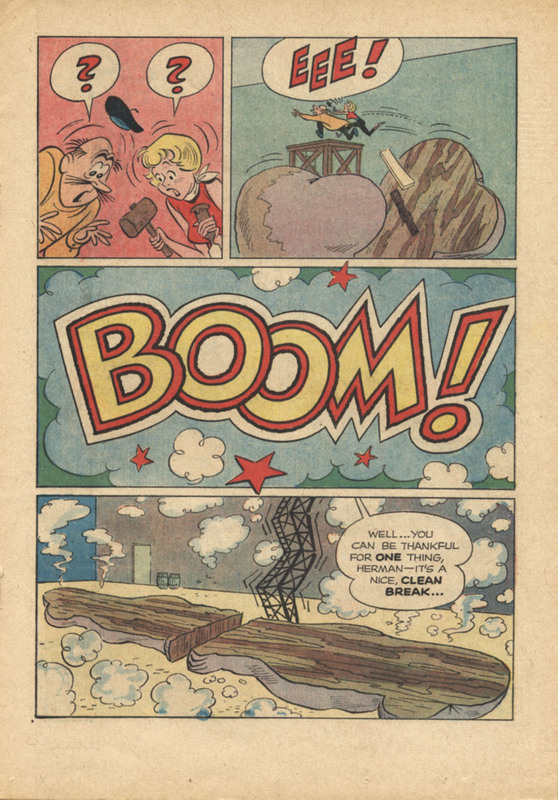 It may have discouraged Stanley from using precious time--energy that could more productively go into Little Lulu and his other steady gigs--on the high-stakes risk of floating unknown creations. Thank goodness the comics industry was in a state of flux in 1961. Super-heroes noodged their way back onto the shelves, while steadfast genres such as crime, western, romance and what passed for horror, post-Comics Code, dwindled or died. 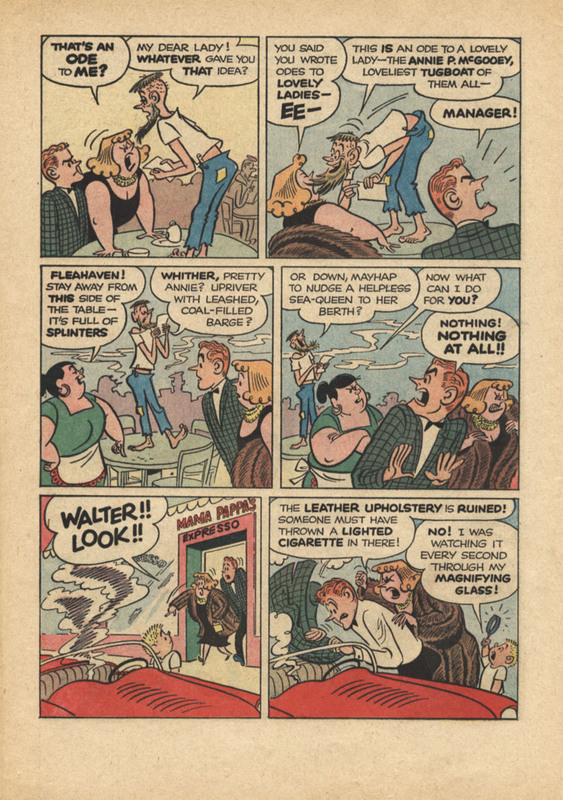 War comics continued to sell, as did many varieties of action-adventure and humor. At this time, Stanley and his family lived in Greenwich Village. Perhaps this daily exposure to the bohemian vibes of that ultra-hip neighborhood inspired Stanley to try something different. For the first time in his career, Stanley created a title that was clearly aimed not at kids but at young adults, teens and college students. 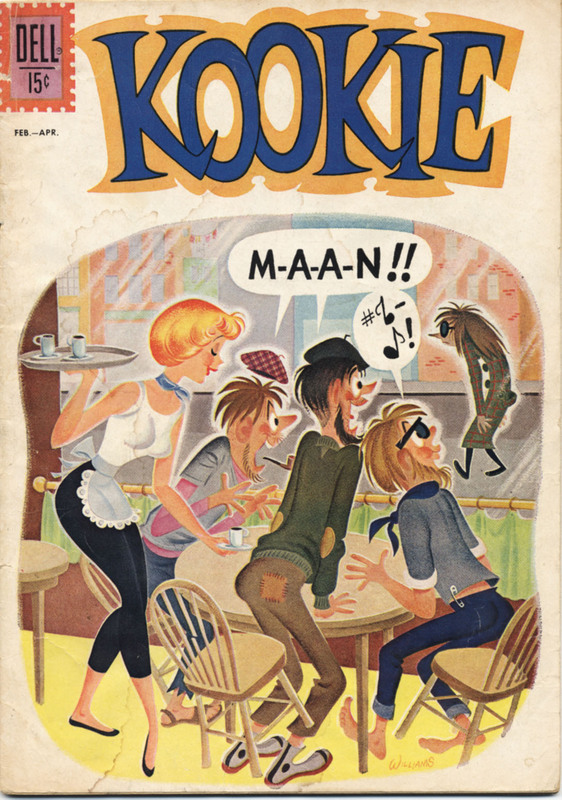 Kookie, launched two months after Stanley's first original success in comics, Dunc 'n Loo, proved a quick flop. Both were collaborations with Stanley's finest artist, Bill Williams. Why one clicked and the other didn't is puzzling. 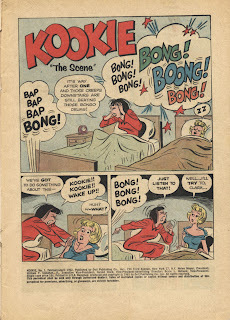 Perhaps Kookie was a little too libertine for mainstream comics. 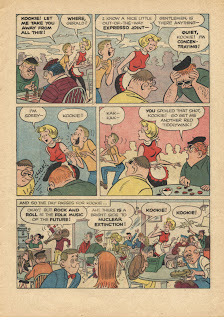 It's among Stanley's only comics with any acknowledgment of adult desires. Kookie is cast as a sorta-Candide of the espresso house scene. Given time, her role would have been more well-defined. She is, certainly, no Little Annie Fanny, but she's a great deal more voluptuous--and inspires more, shall we say, grown-up reactions from her male pursuers and admirers--than any Stanley character, before or since. 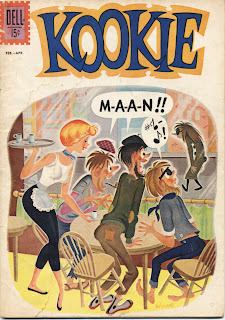 By late 1961, when its first issue hit America's news stands, beatniks were a bit on the wane. The Beat Generation still existed, and some of its more notable authors and artists continued to create vibrant, striking work. 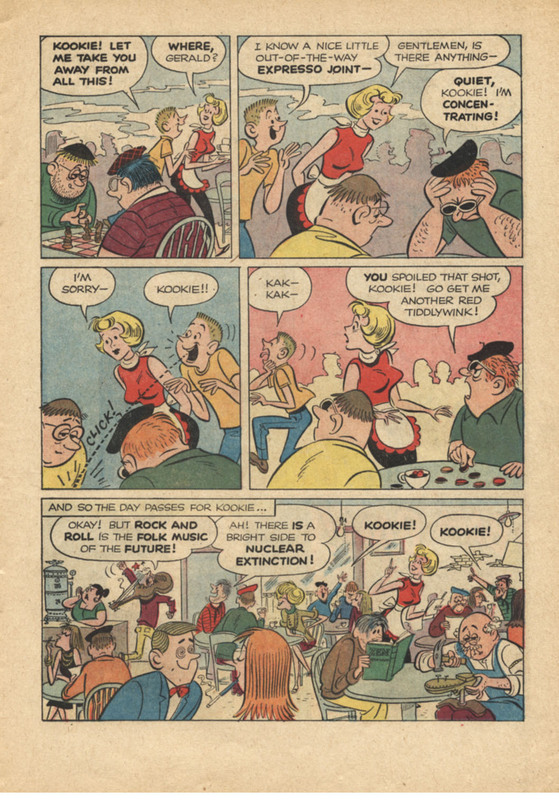 But the whole scene was already reduced to a handful of popcult cliches--Maynard G. Krebs from TV's Dobie Gillis, Ernie Bushmiller's outrageous put-downs in the newspaper version of Nancy, and countless beatnik wanna-bes in popular fiction. 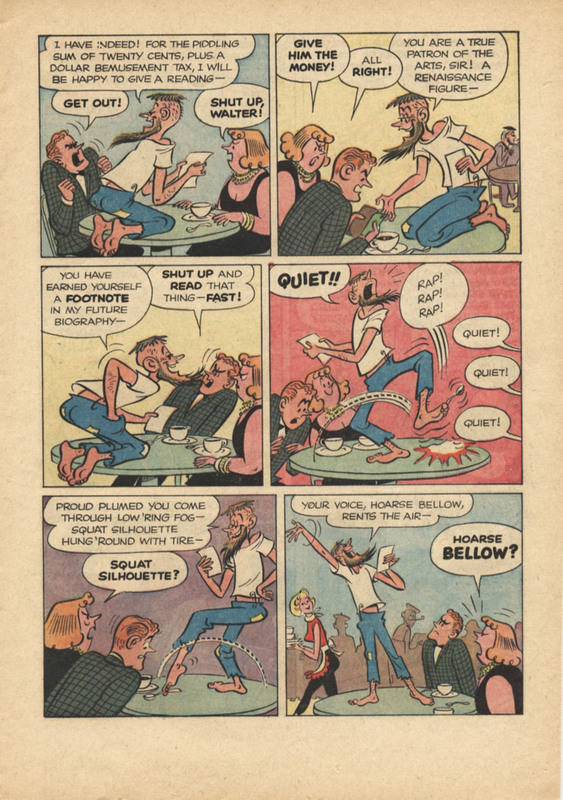 Stanley's take on the beat scene owes a little to Max Shulman's Dobie Gillis sitcom, which it resembles in its cramped, grubby urban settings and with its risible, exaggerated characters. 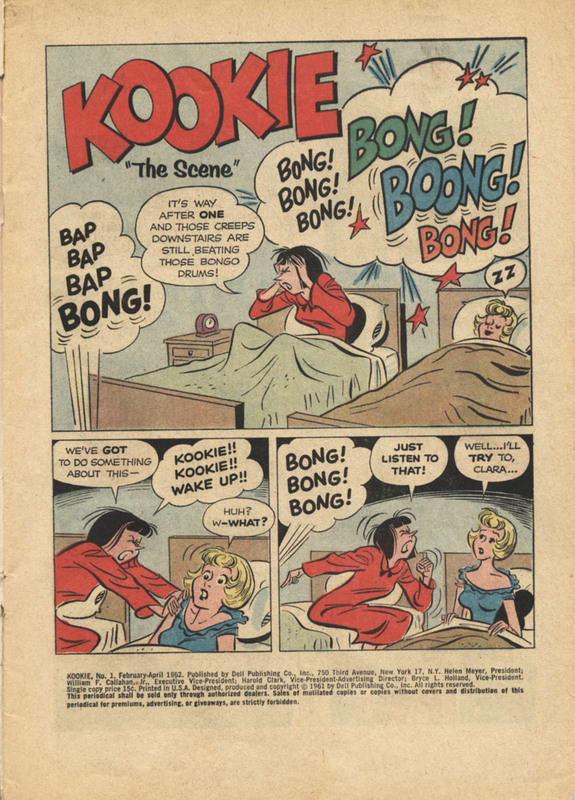 Dobie was only peripherally related to the beat scene, but the program's snappy pace and colorful patter has much in common with Stanley's work of 1962. 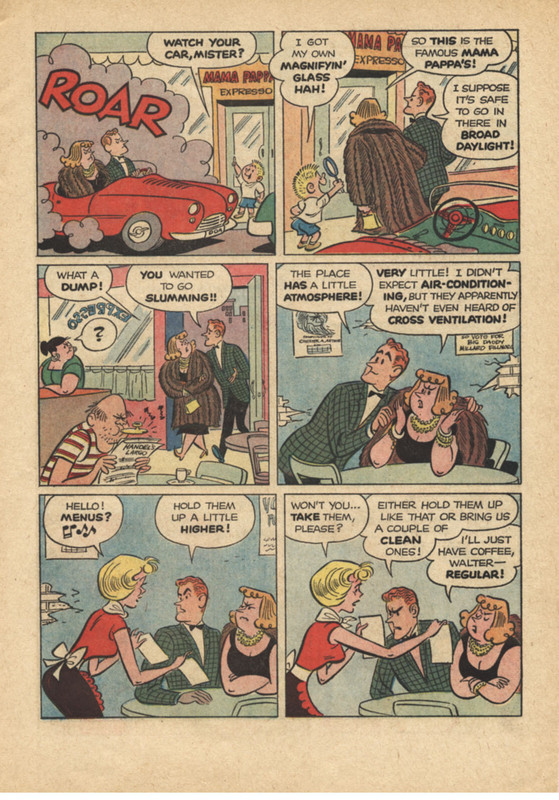 Here's "The Scene," the first story from the first Kookie issue. I posted a story from the second, and last issue, here. In that post, I posit some other theories about Kookie's marketplace failure. But first, dig that righteous cover! 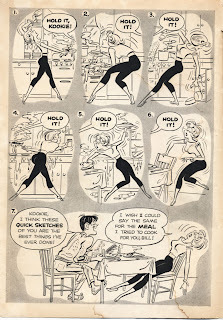 Bill Williams' beautiful cartooning looks gorgeous in watercolor or gouache, whichever medium it's painted in. 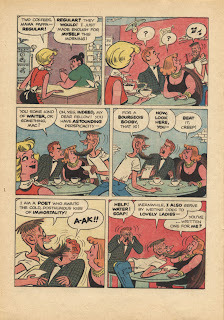 Here's the inside front cover gag--a format among John Stanley's fortes as a comics creator. "The Scene" is unusual for Stanley. Its narrative doesn't hinge on a single, escalating event. Rather, it paints a leisurely paced series of highly comedic vignettes--expertly designed to ease us into its quirky urban world. Though Kookie is the star of the story, she isn't really its main focus. Like Jacques Tati's 1967 movie Playtime, "The Scene" isn't married to any one character or occurrence. Big things happen--roomie Clara's creative revenge on the bongo-mad dudes who plague her sleep; the wonderful beat poetry performance of Fleahaven; the entrance and exit of the two "bourgeois booby" richfolk; the epic cleaving of the sculptor Herman's three-story statue. Big characters crowd the stage, one after another, as Kookie watches and reacts. Stanley does not condescend to his bohemian cast, nor exploit them for a cheap laugh. 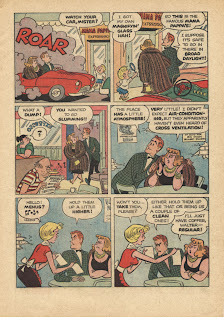 The buffoons of the piece are the two uptown types who wander into the world of Mama Pappa's expresso house--and pay for their slumming with social humiliation (witnessed by an audience who doesn't really notice or care) and a scorched leather car-seat. 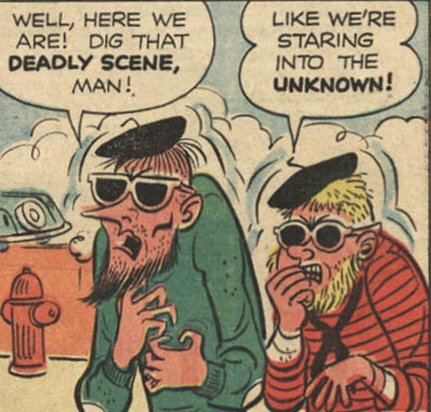 Something decidedly different happens in the 18 pages of "The Scene." 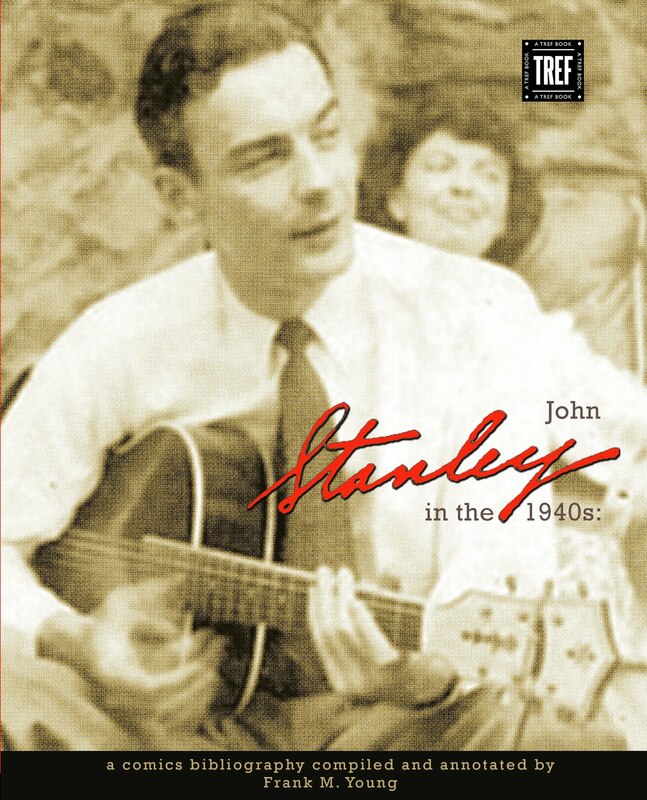 There's not another John Stanley story quite like it--which is a pity. 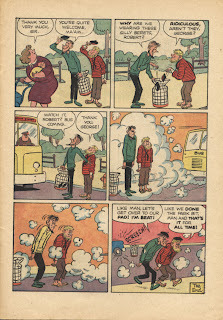 "The Scene"'s expansive, democratic approach, and its creation of a world both gently and vigorously funny, suggests unfulfilled possibilities for this series (and for Stanley's work), had it lasted more than two issues. 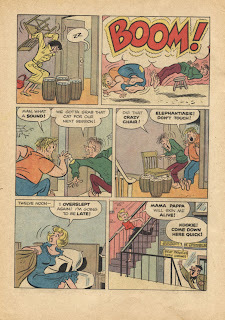 1962 comics had to have an unrelated second feature, in order to qualify for postal distribution. 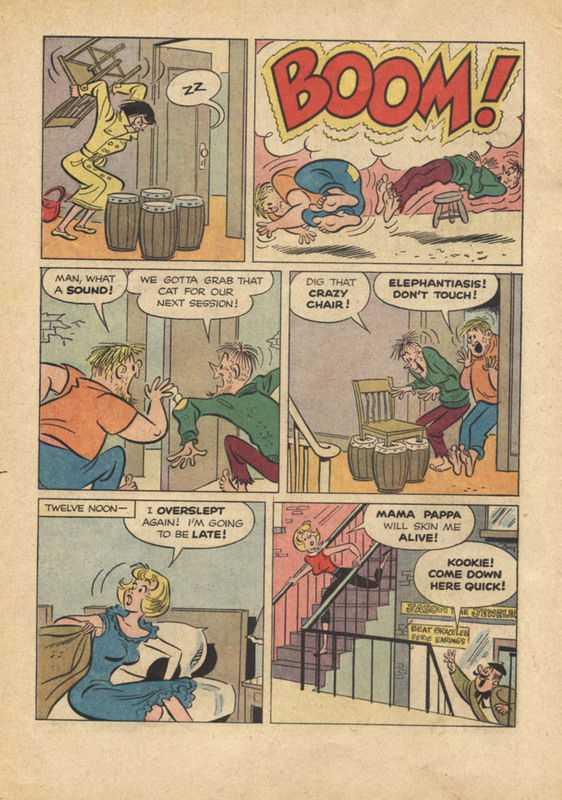 "Bongo and Bop" was Stanley's solution to that need. 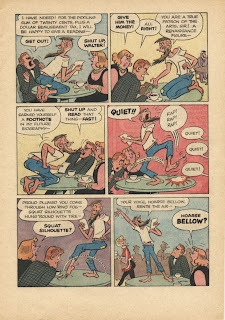 It's a more hard-edged, brilliantly funny piece that anticipates the 1970s underground comix humor of Gilbert Shelton. 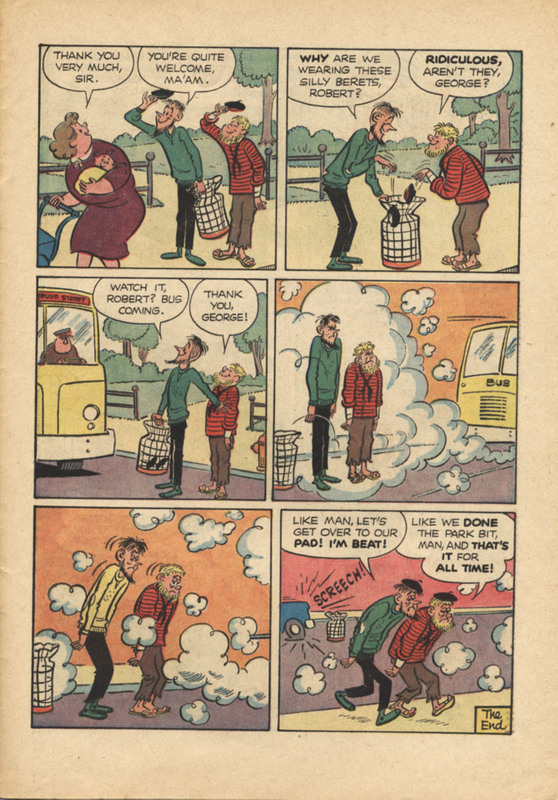 The urban landscapes of "A Breather" are familiar to Little Lulu readers. Unlike Stanley's scores of lark-in-the-park stories, this achieves a sublime level of character and black comedy, in five easy pieces (er, pages). Bongo and Bop look somewhat alien and insectoid, with their berets, gaunt cheeks and oversized dark glasses, but Stanley once again doesn't treat them with condescension. They are a refreshing twist on his typical "Tubby Type." They're deluded, but susceptible to outside influence. 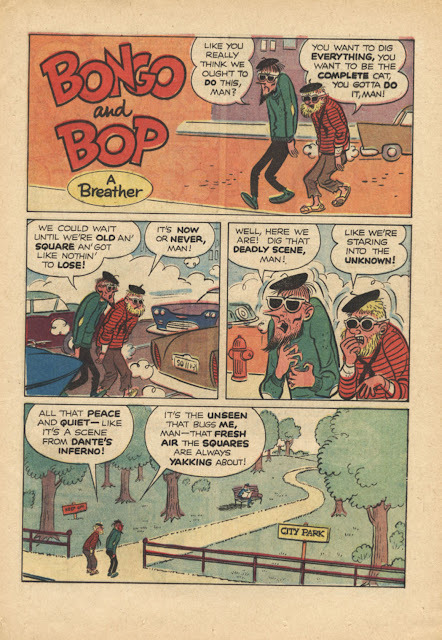 In the story's sublime ending, Bongo and Bop temporarily morph into "squares"-- until a lungful of carbon monoxide revives their true selves. 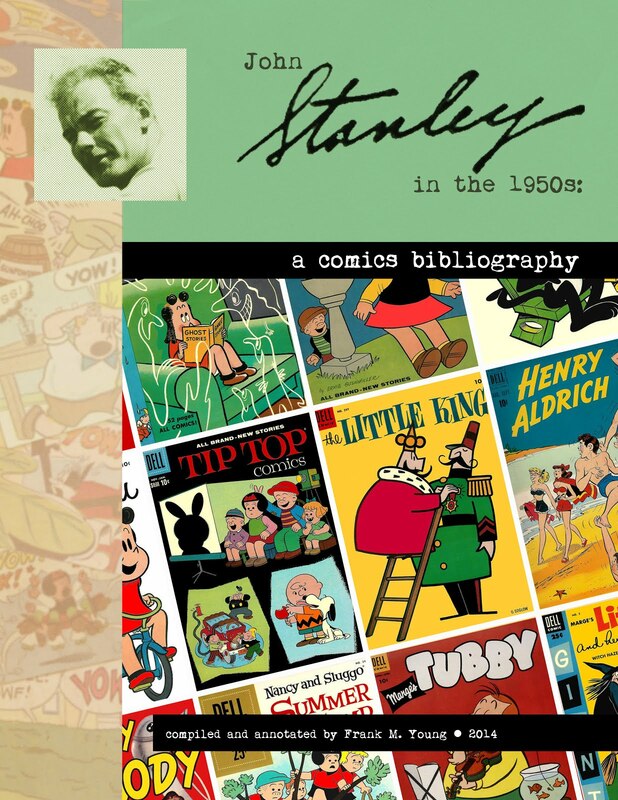 This return to form distinguishes Stanley's work. Most other humorists would have played the change to "normalcy" for boffo laffs, as if to say "See? This beatnik thing is just an affectation!" 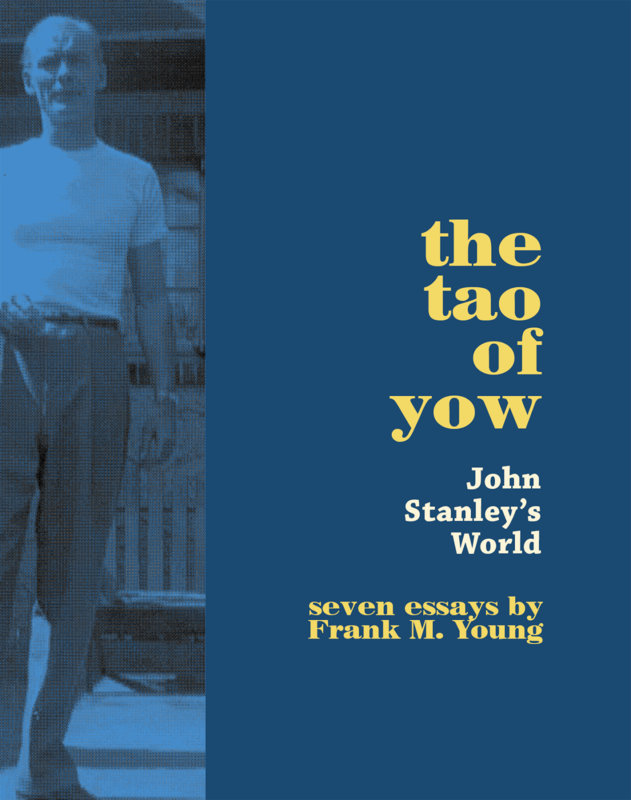 In John Stanley's world, you are what you are. Hero or zero, his characters are true to their tendencies and tics. Stanley never again had--or gave himself--the luxury of pacing, nor the openness of his comedic attitude, that is evident in the brief life of Kookie. This is John Stanley at his warmest and most down to earth. 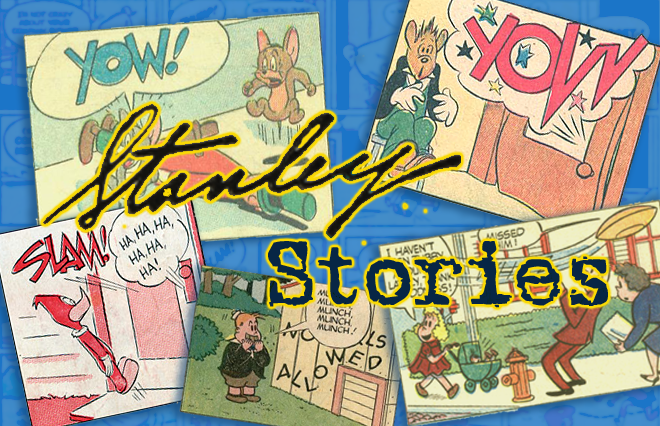 My next post will be the 200th for Stanley Stories. I hope to have something special to mark the occasion. 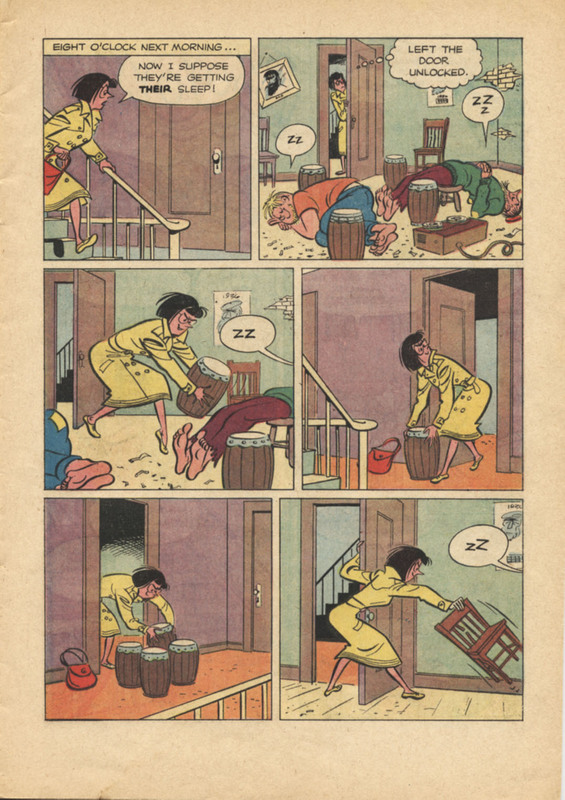 I just got the giant size little lulu #1, but I haven't learned to pick out Stanley's writing over Marge's yet. I'd love more information on whether these have been collected in other TPBs. How was Stanley's take on Nancy different from Lulu? 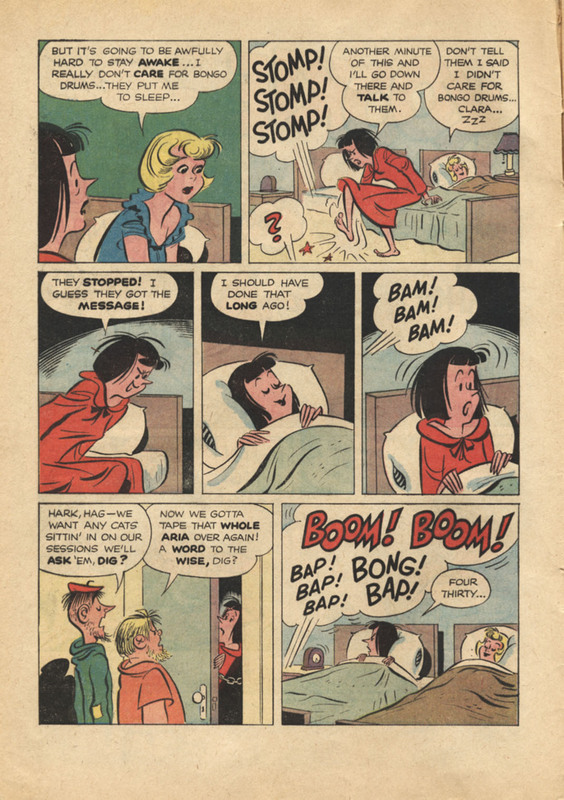 Firstly, the writing in that Giant-Size Little Lulu is ALL Stanley's work. Marge never wrote a word of the comic-book version. 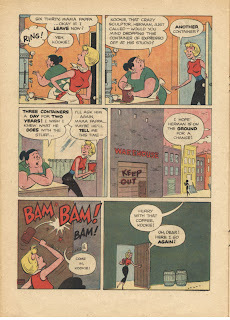 She sort of looked over John Stanley's shoulder as he wrote the first of the LULU comic books in 1945. 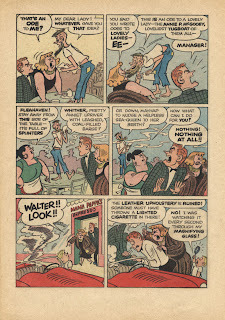 Even then, it was all Stanley's work, through the 1959 issues. Secondly,a visit to amazon.com will show you the many trade paperbacks Dark Horse has compiled of Stanley's LULU and TUBBY material. 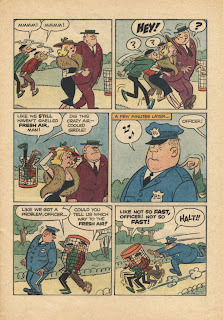 You'll also find Drawn + Quarterly's Stanley books, and other volumes that reprint his work, including the indispensable TOON TREASURY OF CLASSIC KID'S COMICS. 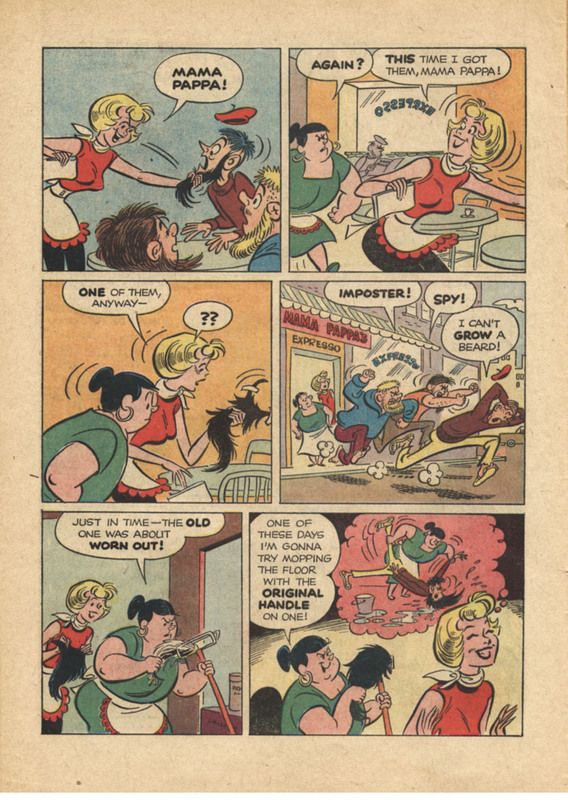 As for the difference between LITTLE LULU and NANCY, you need only consult the many posts on those two Stanley series found here on the blog. 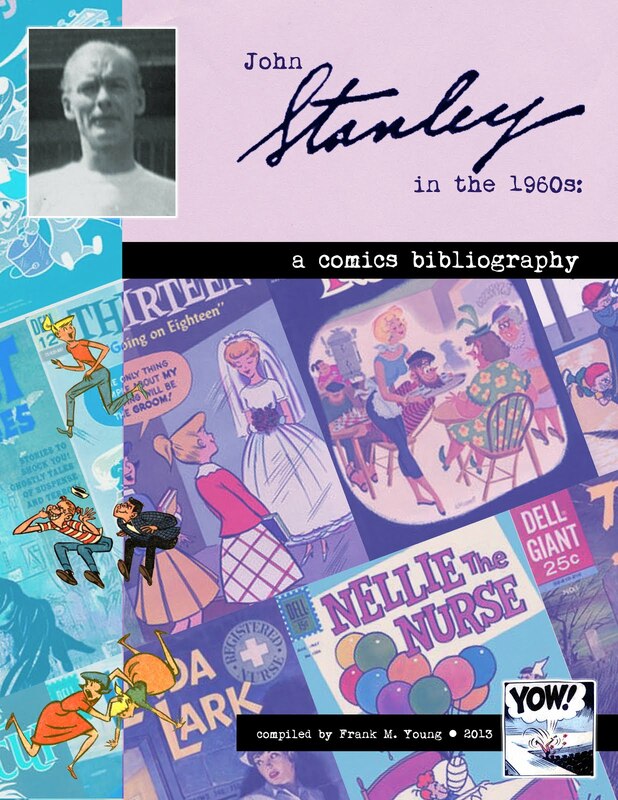 There are currently 305 stories of John Stanley's available here. Hours of reading await you--enjoy! Congratulations on this amazing blog. I came to Stanley's work through my six-year-old son, who got me to take out one of the collections from the library. I was immediately taken with the wit, sweetness and complexity of the relationships between the characters. I have only dipped my foot into your blog (as it were) but have already read a number of the stories right off the screen with my son (who adores the stories and reads them over and over). 1. We've read some of the giant Little Lulus from 1960 - Lulu and her Halloween friends, Lulu in Hawaii. Are these then not by Stanley? Who are they by? Whoever it was sure got his style down pretty well. 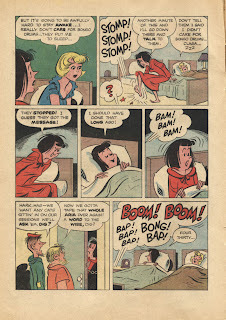 "I also see a bit of similarity to Charles Schulz's 1940s cartooning. The faces of the figures, and the pen line, are close to Schulz's way of rendering. Of course, there's no way Stanley could have seen Schulz's early work. 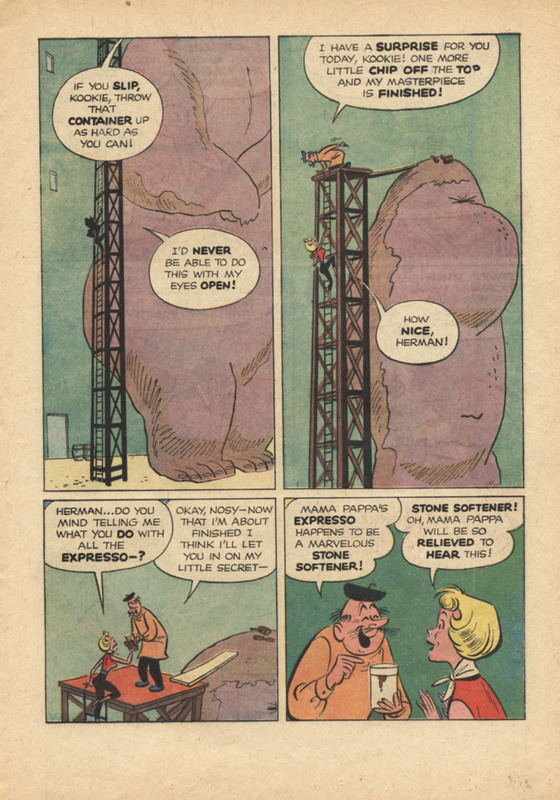 It's more of a zeitgeist thing, as many post-war cartoonists sought to work in this visually pleasing manner." Have you compared the two men's work elsewhere on this blog? I have looked and looked and nowhere have I seen anyone point to the obvious debt Peanuts seemed to have to Lulu. This could be a lapse on my part, but it cries out to me whenever I read these stories (as someone who adored Peanuts as a kid in the sixties). Esp. 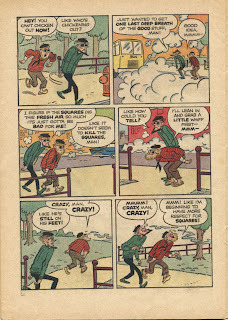 in the open mouth scream (a big round black O) Schulz seems to have taken a lot of his early influence from Stanley. Obviously, Schulz made certain choices (to remove the parents entirely from the stage) and adding some adult vocabulary to the mix - but it seems to me there is actually more depth and complexity in Tubby and Lulu's relationship, with the constant change in dynamics - sometimes adversaries, sometimes best friends, sometimes "boyfriend and girlfriend" etc - thsn in the static relationships between the Peanuts gang, who seem fixed in their roles from the get go. Sorry to go on and on, but your insights and erudition with regards to this master storyteller prompted me to write at this length! Thank you! I thank you for your long, insightful letter. I'm glad that you and your son are enjoying the site! There's enough material to read here to keep you both entertained for some time. 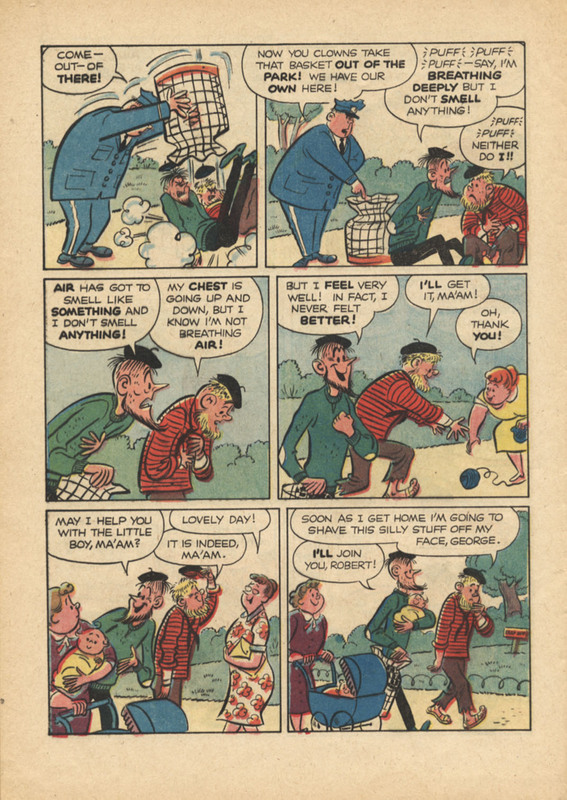 To answer your questions: No LITTLE LULU giants after 1958's second Summer Camp issue are written by Stanley. Stanley's successors did an adequate job of aping his style, in a superficial way. The depth of Stanley's characterizations, narratives and themes are sorely missing. After awhile, these post-Stanley LULUs become disenchanting... they ring hollow; they're just slavishly following the Stanley story formulas, with nothing new to say. As for the Schulz vs. Stanley concept: I would be greatly surprised if Charles Schulz knew, or read, John Stanley's comic book work. 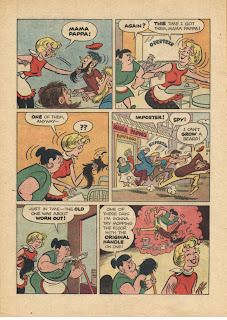 There are fascinating parallels between PEANUTS and Stanley's LITTLE LULU (and NANCY) stories. There are also huge differences. The largest is that Schulz worked in a non-narrative daily comic strip. He occasionally did one-week or two-week continuities, but they were always "soft" ones, still geared towards the daily dose of an ironic or subtly funny punch-line. 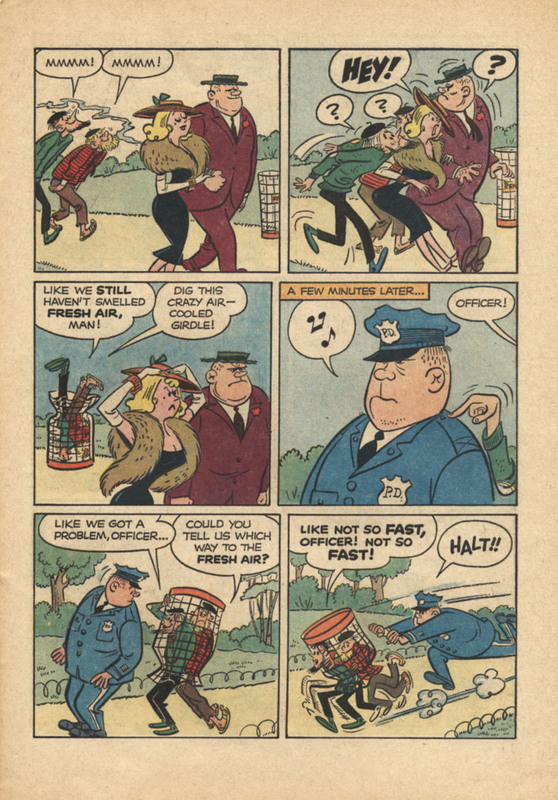 Stanley and Schulz's art styles of the late '40s/early '50s share some commonalities. 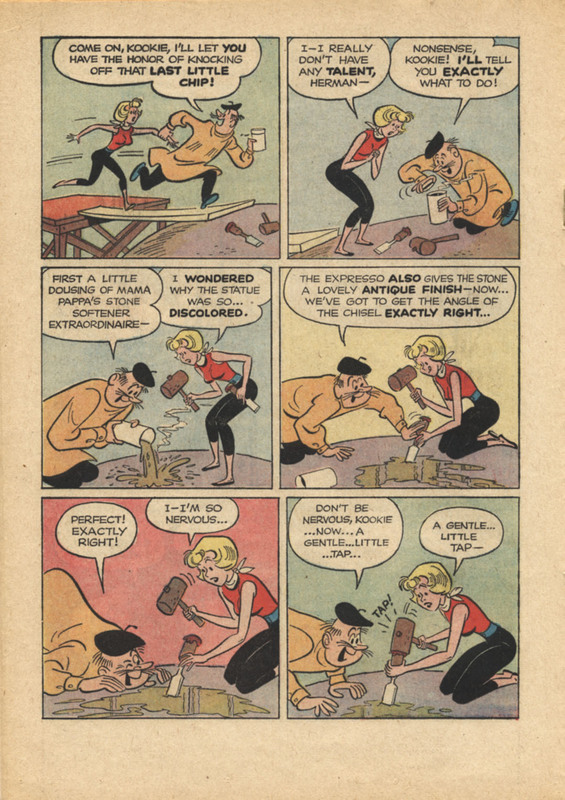 This simplified approach to cartooning was born in the magazine cartoon market in the 1940s, and was also seen in advertising art. It was a major trend away from the old-school style of cross-hatching, greater detail and a hint of realism. Schulz did not have Stanley's luxury of long, involved narratives. What Schulz did was meant to be digested in a matter of seconds. Stanley's stories take longer to read than the average comic-book narrative, due to their verbal and visual info. Schulz had what Stanley lacked: mainstream respectability. 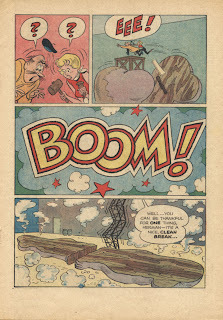 PEANUTS was often the lead strip on American Sunday comic sections, especially from the 1960s on. Being a PEANUTS reader was a badge of hipness in the '50s. 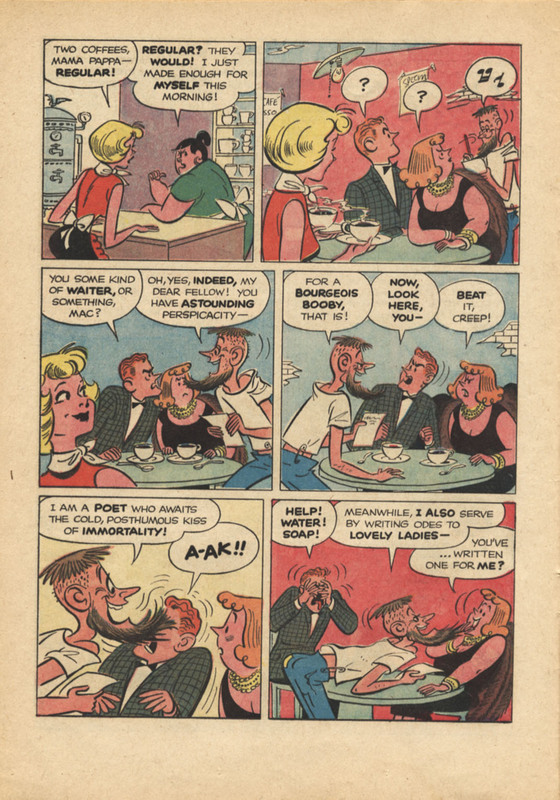 The same audience would have, likely, been mortified, were they seen reading a LITTLE LULU comic book in public. I consider John Stanley a superior cartoonist and writer to Charles Schulz. I loved Schulz's work as a child. I consider my pre-teen readings of PEANUTS a very important factor in the shaping of my world-view. Reading PEANUTS again as an adult leaves me wanting more than it can deliver. While I still admire many things about it, the bite-size moments of PEANUTS are ultimately not nourishing to me. Stanley's work lasts longer, achieves more and says more, in my opinion. 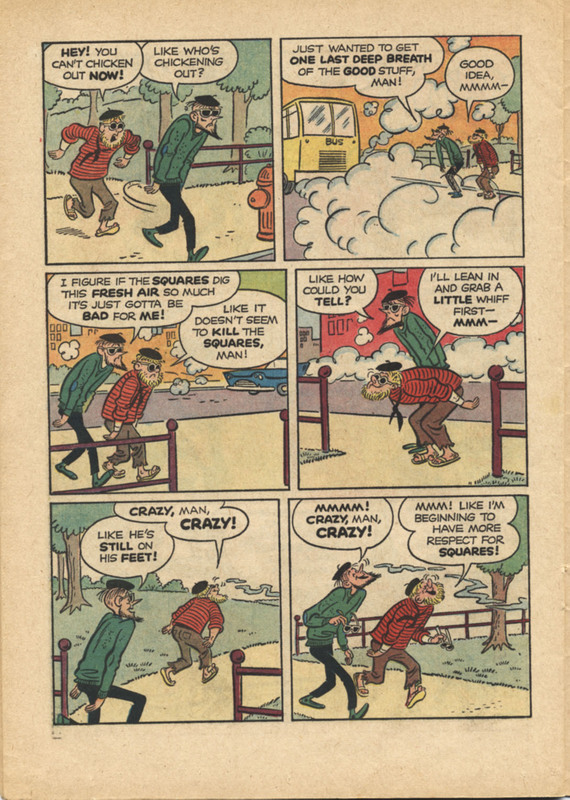 Perhaps if Schulz were able to do longer narratives, he might have met or exceeded John Stanley's work. The two men shared a deep identification and understanding of their characters. Wonderful comic!! "The Scene" was hilarious. I would have loved to have seen more of Mamma Pappa. 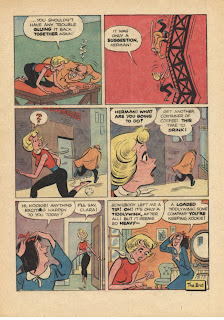 It's too bad John Stanley couldn't do more than two issues of Kookie. I'm sure he would have expanded the world of the characters and made it as rich and funny as anything he did for Little Lulu.